Thanks for letting us help you. Situated directly on the Atlantic in Folly Beach and just to the right of the main hotel on the ocean, Charleston Oceanfront Villas offers three- and four- bedroom luxury condominiums. 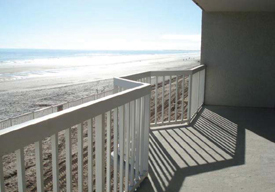 With spacious living areas and large balconies overlooking the beach, you might just want to stay forever. In fact, some lucky people enjoy year-round living in this delightfully funky beach community. The building itself is attractive and recently has been updated with new stucco, metal roofing and fresh landscaping. The $4.5-million improvement project also included new fencing, insulation and gated ADT security with video surveillance. Two pools on the property also were upgraded, but the real draw is the six miles of beautiful beach, which is known for its surfing opportunities. Meanwhile, amazing sunrises and sunsets are daily spectacles that induce locals and visitors alike to stop and enjoy the beauty of nature. �It�s very idyllic to sit on the balcony. The ocean is mesmerizing. The beach is beautiful,� Landry said. 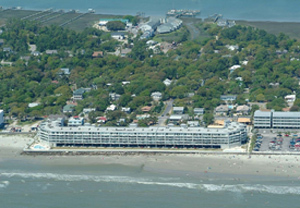 As an agent with Dunes Properties, Landry knows that a home at Charleston Oceanfront Villas is an excellent buy. But even with his real estate experience, having been a resident for a month or so has reinforced just how spectacular these homes are. "Situated directly on the Atlantic in Folly Beach and just to the right of the main hotel on the ocean, Charleston Oceanfront Villas offers three- and four-bedroom luxury condominiums." �It�s about lifestyle,� he said. The town of Folly Beach, known fondly as the �Edge of America� by locals, is a wonderful, tightknit community. An eclectic group of shops and casual eateries invite you to stop in. The beach beckons you to stroll along the surf. The Edwin S. Taylor Fishing Pier, where you might be lucky enough to land a big one, stretches more than 1,000 feet out into the Atlantic. At the northeastern end of the island, an old Coast Guard station has given way to a bird sanctuary, and, at the other end, is Folly Beach County Park. Should you have a need to go downtown, historic Charleston, with its many shops, restaurants and nightspots, is just a 15- or 20-minute drive. But, like Dave Landry, perhaps you�d like to relax by the ocean for a while longer.